← And so there was a launch! Since Vigil currently has no release date for the US (don’t blame me, we’re waiting for a US publisher to pick up the rights – write to your publisher! Your congressperson! The President! 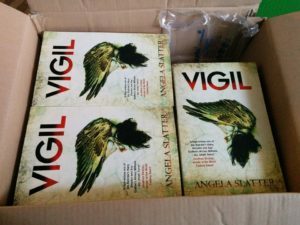 ), I’m giving away two copies of Vigil just for you folks. So, go here and do the clicky-entry thing. This entry was posted in News and tagged goodreads giveaway, urban fantasy, Vigil. Bookmark the permalink.